The communications show Bowman, director of the CDC's Division for Heart Disease and Stroke Prevention, was eager to help her long time friend Alex Malaspina, a former top Coca-Cola executive and strategist who founded International Life Sciences Institute (ILSI), a Big Food industry front group. The division led by Bowman is tasked with providing "public health leadership," working to reduce the prevalence of obesity, diabetes, heart disease and stroke. However, Bowman had another interest – helping the food industry gain approval for its unhealthy products. "Emails from 2015 detail how Malaspina, representing the interests of Coca-Cola and the food industry, reached out to Bowman to complain that the World Health Organization was giving a cold shoulder to the chemical and food industry-funded group known as ILSI, which Malaspina founded in 1978," says USRTK journalist Carey Gillam, writing for The Huffington Post. "The email strings include reports of concerns about Coca-Cola's new Coca-Cola Life, sweetened with stevia, and criticisms that it still contained more sugar than daily limit recommended by WHO." The WHO has been very vocal about the importance of eliminating sugary drinks from the diet in order to reduce the risk of childhood obesity, type 2 diabetes and other serious health problems. "Sugar-sweetened beverage consumption is high in many parts of the world and is suggestive of poor dietary quality, as sugar-sweetened beverages contain added sugars such as sucrose or fructose, often in large amounts, which contribute to the overall energy density of diets," said the WHO in January. "The calories provided by sugar-sweetened beverages have little nutritional value and may not provide the same feeling of fullness that solid food provides. As a result, total energy intake may increase which can lead to unhealthy weight gain." This of course, infuriated Coca-Cola, prompting Malaspina to ask Bowman for help in setting up a conversation with the WHO to try and influence their recommendations on sugary drinks. Coca-Cola: "The threat to our business is serious"
Several top executives with Coca-Cola and ILSI were copied on the emails sent to Bowman. They expressed grave concern regarding "negative reports about products with high sugar content, and sugary soda tax plans in Europe," reports Gillam. Actions by the WHO could have "significant negative consequences on a global basis," said Malaspina in the email chain. "The threat to our business is serious." Included on the correspondence were Coca-Cola Chief Public Affairs and Communications Officer Clyde Tuggle and the company's Chief Technical Officer Ed Hays. Malaspina told Bowman that "something must be done" about the WHO not wanting "to work with industry." 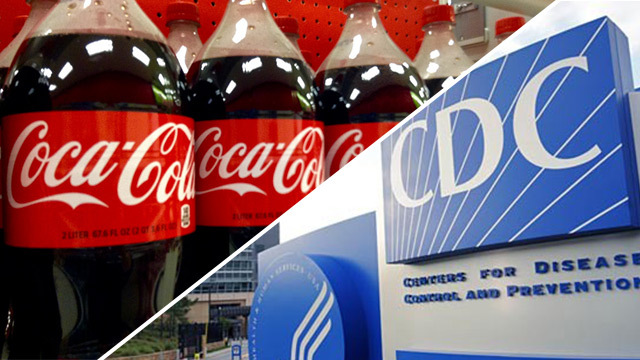 Bowman tells the Coca-Cola execs that either Bill Gates or "Bloomberg people" may be able to get him access to the WHO, suggesting they also reach out to someone at the PEPFAR program, a U.S.-backed program addressing the HIV/AIDS epidemic in sub-Saharan Africa. "WHO is key to the network," confirms Bowman, adding that she "will be in touch about getting together." Malaspina proceeds to thank Bowman for the good leads before suggesting they meet for dinner soon. The CDC has yet to assume any responsibility for the inappropriate communications. Bowman's boss, Ursula Bauer, Director at the National Center for Chronic Disease Prevention and Health Promotion, said she doesn't find the relationship a conflict-of-interest. Though Bauer defended Bowman's actions, she admitted in an email to staffers that Gillam's article doesn't bode well for the agency. The "perception that some readers may take from the article is not ideal," said Bauer. She reminded CDC employees that if they wouldn't want to see it on the front page of the newspaper, they shouldn't be doing it. All of the emails but one were sent from Bowman's personal account. Bowman announced a "late retirement" shortly after the emails broke, not mentioning the revelations about her Coca-Cola connections. Bauer applauded Bowman's work in another email sent to staffers, saying she "served with distinction and has been a strong, innovative, dedicated and supportive colleague."